As the title suggests, this is a personal journey of faith. Faith renounced then found; but not just found, rediscovered with a clearer understanding of God's Word and what it means for mankind. 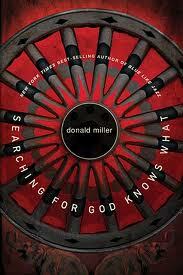 Having read only two of his books, I am a huge fan of Donald Miller's writing. I especially like the way he includes the reader in his personal struggles with life, God and faith. I highly recommend this book. It's an easy, entertaining read, but at the same time will make you think long and hard about what you really believe about God and Scripture.